The death of a teenage girl while she was training for the Ten Tors challenge is not how organisers wanted the annual event to be brought into the spotlight. The expedition on Dartmoor, which is held in May, is an annual rite of passage for thousands of youngsters from all over the UK and abroad. They walk on routes of up to 55 miles (86km) over two days in what are freely admitted as challenging conditions; battling weather, blisters and fatigue. The reward for this effort is a treasured medal in what many participants have said through the years is a cherished character-building exercise. The first Ten Tors, the brainchild of three Army officers who felt that the moor would provide a challenge for civilians as well as the soldiers who trained on it, attracted 203 boys and girls in 1960. It has since grown and is now in its 47th year. Some 2,400 boys and girls in 400 teams of six members are expected to take part this year. The event, run since 1997 by the Army's 43rd (Wessex) Brigade, attracts entries from hundreds of schools, youth organisations and military cadets. The challenge starts from the Army's Okehampton camp in the north of the moor, and requires the well-equipped teams to trek across the 365 square-mile Devon wilderness, spending one night in tents before reaching the finish. In the weeks before the event, teams go out on the moor to train for whichever of the routes they are going to tackle - 35, 45, or 55 miles (56, 72 or 86km) - depending on age. Those taking part have to carry all the food, drink and shelter they need, including clothing to cater for weather changes for which the moor is notorious. But despite the extensive preparations that organisers and participants make, unpredictable weather on the moor has caused problems for those taking part over the years. In 1998, temperatures were over 25C (75/80F) throughout the event, and dehydration was a major risk. In May 1996, Dartmoor was struck by a snow and sleet storm over the Ten Tors weekend. The teams had to contend with poor visibility and numbing cold. About 2,100 of 2,400 participants were evacuated from the moor in some of the most extreme spring weather seen on Dartmoor. 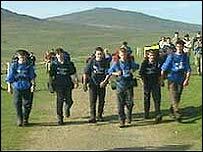 There was no Ten Tors Challenge in 2001, due to the foot-and-mouth outbreak. But despite the weekend's training accidents, outdoor groups say it would be wrong to stop young people taking part in such events. Ian Lewis, from the Campaign for Adventure, said: "We have the need for risk and adventure in our young people's lives. "We know that if they don't get enough risk and adventure in a socially acceptable form - and I have to say the Ten Tors in particular is a fabulously socially-acceptable form - then they go to an unacceptable form and end up illegal and anti-social." The Army is also keen that the trek goes on. It has offered sincere condolences to the family of the dead girl from Bideford, as well as to her friends, and the students and staff at her college. But it but added that, at present, there were no plans to cancel or change the 2007 event.